We can't wait to spend this year in our new house. Only 2 months until we move in. Lots to do! As we've been renovating, we've discovered all sorts of secrets under those rugs. When we pulled up the carpet in Jack's room (bottom left) we found hardwoods! 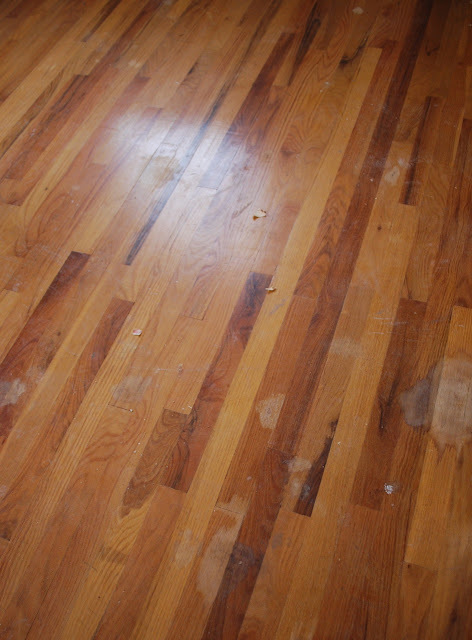 And hardwoods in good shape at that! This was a total surprise as we had already torn out the carpet in the hallway and master bedroom and only found sub-floor. We really thought about refinishing it and keeping it until we found this. 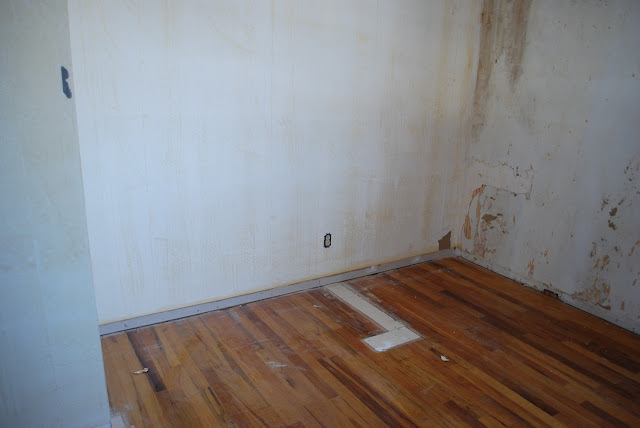 Drywall as a floor patch. Huh?? We deduced that there must have been a closet and built in here, the mimics the one on the other side of the room. Though we could have taken some wood out of the closet to patch the missing planks, we've decided to go ahead and lay our cork floors over. 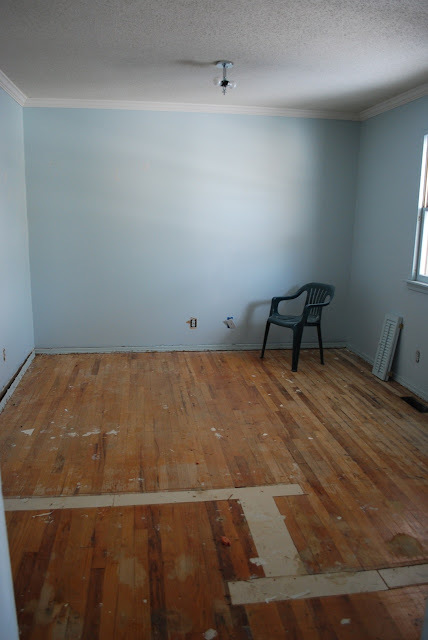 We'll leave refinishing the flooring for the next owners. Now enter the "blue room." 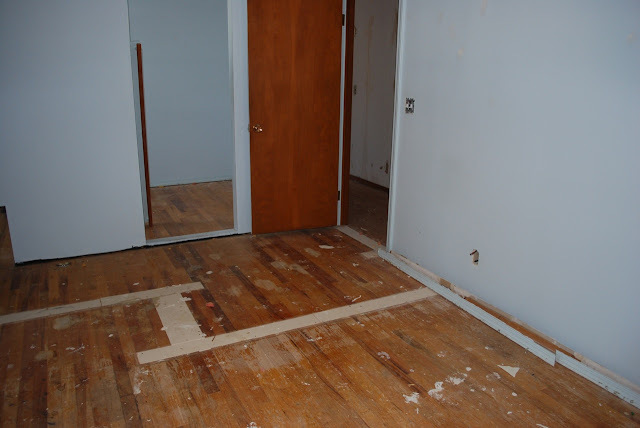 Even before removing the carpets, the third bedroom was a mystery to us. Though it is difficult to see in this picture, there is a small room within this room. 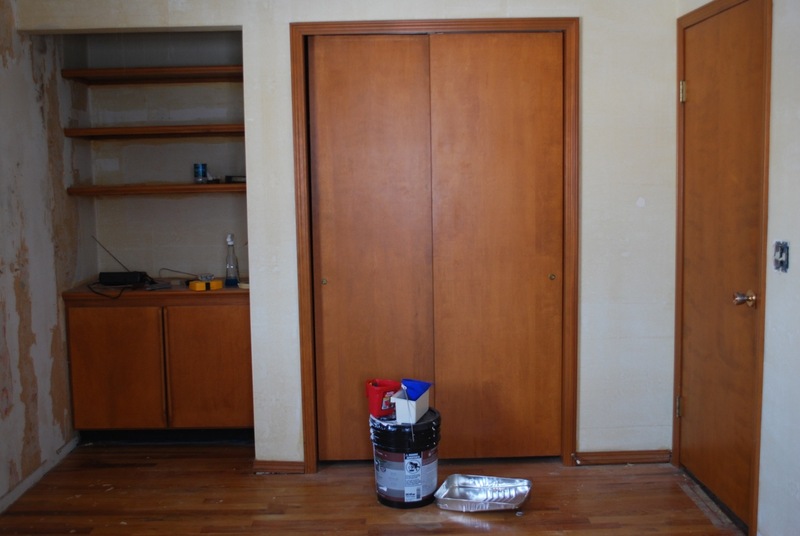 What looks like a mirror to the left of the door is actually a doorway into another small room. 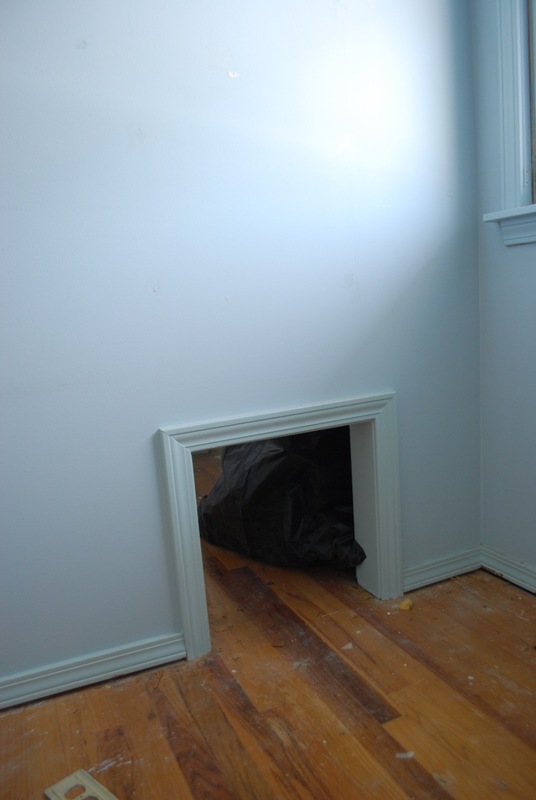 We found out from our kitchen remodelers that this was once a "secret room." The wall was covered in mirrors and if you pushed on a certain spot the door would open. Here is a look inside the "secret room." There's even a window inside. At first we thought the space for this secret room came from a large walk-in closet. 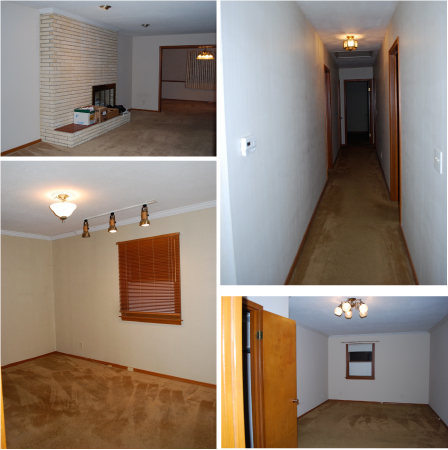 After pulling up the carpet and seeing more drywall patches in floor, we realized that this room was once two bedrooms. The patch marks the old closet and the window in the secret room was once in the 4th bedroom. After ripping out the hallway wallpaper, we found the old door frame for the room too. If the whole "secret room" thing wasn't strange enough for you, there is also this "dog door" in the wall??? Hmm. We've decided to keep our secret room. Until my new basement studio is whipped into shape, I will use this as my office. 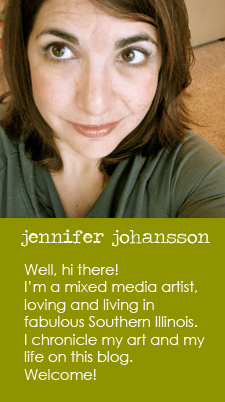 It's really a large space - more that I have now in our condo! The main room will serve as a guest bedroom. We decided it was OK to forego a closet in there for now. Demo, is really pretty much done now. We're starting to build things back up again. 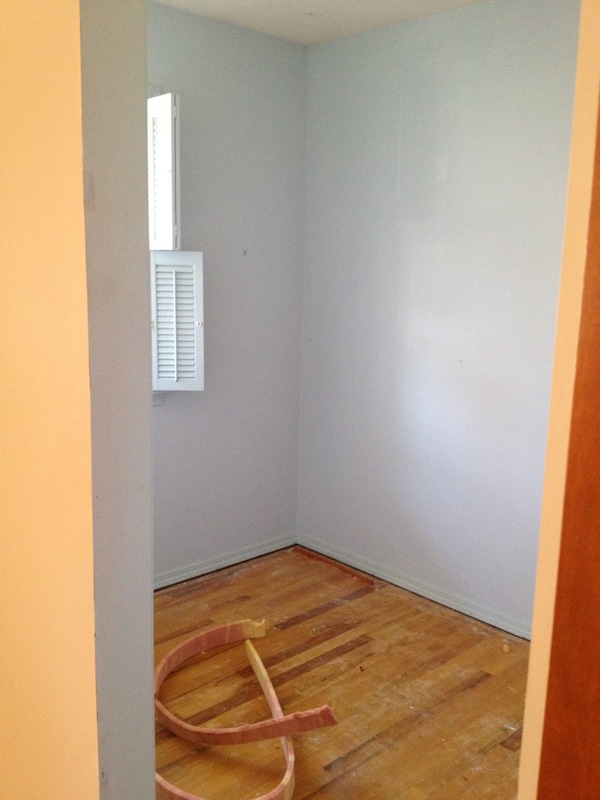 Next week I'll show you our transformed master bedroom!